What better way to enjoy the sublime waters and sights of St. Tropez and the Languedoc region of France than by staying at the luxury camping site of Domaine des Naiades? Modern accommodation, countless recreational activities and family-friendly events await. Please contact a representative from LUX-Camp to learn more. 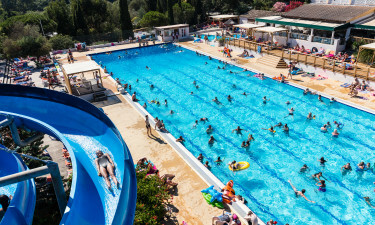 Why Should I Opt to Stay at Camping Domaine des Naiades? A tropical beach that is found only 900 metres from the site itself. Evening entertainment for children and adults. Modern shopping and sanitary facilities. This holiday camping site offers outdoor dining at its finest thanks to a restaurant found quite close to all pitches. Up to 140 guests can be accommodated and this venue is open 7 days a week. A bar within this restaurant is also able to provide a selection of wines, beers and liquors. A miniature market sells daily necessities as well as speciality items such as cold drinks, fruits, vegetables, magazines and tourist-related postcards. One feature which defines this luxury camping site is the presence of a large open-air pool. It is heated during the cooler months of the year and all areas are supervised by trained professionals. 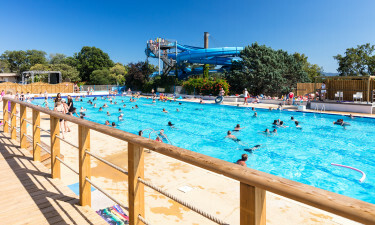 Visitors aren’t just limited to this pool, though; it is always recommended to visit the stretches of pristine sand that have served to define the beaches throughout this area of France. These can be found less than one kilometre from Domaine des Naiades. Some on-site facilities include waste disposal centres, private washing rooms, play areas for children and an information kiosk found at the reception desk.